Patience my friends! Shortly before my good friend Earl Siddall died I noticed sitting on a desk in his den a photo-copy of a great photograph. As I almost always did, I said I would love to have a copy of that someday. “Patience my friend!” It must have been obvious I was turning inside out just jumping to get a hold of it! Earl had a way of knowing those things and loved to taunt you if he thought he could string you along. A few short months later and he was gone, and in the confusion that follows, so was that picture. Then in the winter of 2002 I received a phone call from one of my “thousands of readers” telling me he knew of some great pictures (and where they could be located) of the 1909 reconstruction of the west Port Maitland pier. That is what the subject was in Earl’s photo. To make a very long and complicated story considerably shorter, I was at the Dunnville District Heritage Association display in February 2003 showing a number of Stromness school photos and met June High, formerly June Pyle of Stromness. One thing led to another and she offered me some great Stromness photos. That led to a visit to her home and a discussion about Port Maitland photos. It seems she was the owner of the aforementioned 1909 Port Maitland photos. She thoughtfully, loaded them to me and I will share a couple with you during this three part article. You might remember this time period was during the lead up to the 2002 reconstruction of the West Pier and removal and placement of the new break wall for the East Pier. A few years after the closing of the war of 1812, John Howison, visits the Naval Reserve and mades some recommendations. John Howison, wrote a book titled Sketches of Upper Canada, published in Edinburgh in 1821. One of the recommendations is . . ., “The mouth of this river must form a post of some importance when we are at war with the United States and might be rendered far more effective than it is at present, were government to strengthen it by raising piers and fortifications: and this seems very necessary, for the Americans must always derive a vast naval superiority on Lake Erie, from the many excellent harbours which abounds in its southern shores.” This statement would imply that there were no piers present during his post 1812 visit. 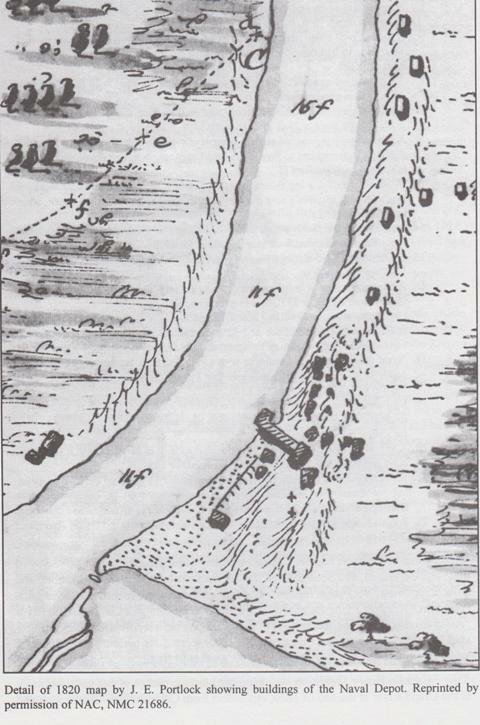 Again from John Docker’s book, Lieutenant Colonel Dunford offered a solution to the problem of the annual sand bar at the mouth of the river. 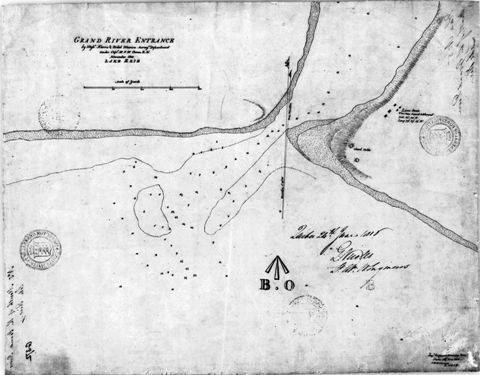 “As I was made acquainted with the great importance of rendering the entrance into this river available for the naval department, I thought it my duty to see the nature of it. . . . A natural bank extends along the shore and side of the river fronting the establishment covering a deep swamp, the surface of which is nearly on a level with that water. I therefore conceive that a canal of communication may be cut in a perpendicular direction to the river and running within and parallel to the natural banks until it arrives in a suitable part of the Bay for construction of two pier heads at sufficient distance apart to admit the vessels. By this plan I expect that no portion of the sediment or sand that forms the shifting bar now preventing the access to the river will ever lodge in the canal. The current of the river will not be interfered in the least and the pier heads can be situated at such a distance from the bar as not to operate on the causes that produce that barrier. Next month we will learn more from John Docker’s writings but with those writing I will add to the confusion more as I attempt to pin down when and where the many piers were built at Port Maitland.